Folks, I’m wiped after a day that started at 5:00 AM. But I hope to have a somewhat lengthy report from tonight’s 5 Under 35 event up after I’ve had a few hours of sleep. 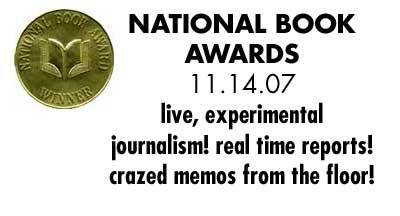 Also, we’ve assembled a crazy crew of bloggers, including Jason Boog, Marydell, Levi Asher, and Sarah Weinman, who will be providing you with live coverage of the National Book Awards on Wednesday night. We’ll have text, pictures, video, and just about every damn thing that technology will permit us to do in a few days as the awards happen! You’re not going to want to miss this, folks. And if you have any specific things you want this group to uncover, let us know and we’ll see what we can do. I also have a few exclusive items that I’ll be posting on when the report goes up. Needless to say, after my conversations tonight, it appears that Denis Johnson is considered to be the favorite, but there appears to be a consensus that there could be an upset victory from Jim Shepard. We’ll see how the speculation holds out. Okay. Now about to collapse. More craziness to ensue!